Have you ever seen a verse in the Bible for the first time – one that you were sure you never noticed before, even though it is underlined in your Bible? That’s what happened to me recently, and I can’t stop thinking about it. Paul prays for the Philippians. He said“..that your love would abound more and more in knowledge and depth of insight, so that you may be able to discern what is best and may be able to be pure and blameless until the day of Christ, filled with the fruit of righteousness, that comes through Jesus Christ – to the glory of God” (Philippians 1:9-11 italics added). I usually have no problem figuring out the difference between good things and bad things, but Paul prays for something greater. He prays that we would learn to discern between the better things and the best things. That is a whole lot trickier. There have been times in my life where the good things have distracted me from pursuing the best things. Other times I was so busy enjoying the good things, I got lulled into a false belief that they were the best things. Mary of Bethany is a woman who learned to discern the best thing. She chose to spend her time loving Jesus; her sister Martha chose serving Jesus. I used to think of the Mary and Martha story as an illustration of personality differences. Martha was a worker, Mary, a listener, but I’m more convinced than ever that it wasn’t a matter of personality but of discernment. Mary’s love for Jesus taught her how to see what the best things were at the moment. Whether sitting at his feet in rapt attention or spilling her treasured perfume over her Savior’s tired and callused feet, Jesus said Mary made the right choice. To be honest, in the busyness of ministry, sometimes I fail to take that quiet time to sit at Jesus’ feet. I struggle to be still, simply love Him, learn from Him and allow Him to fill me with His love. I’m so busy doing things for Jesus, I am not taking the time to be with Jesus. As Christian counselor I know I’m not alone. I work with many women who feel too busy to take time to be alone with Jesus. Multiple priorities, ministry responsibilities, a hectic home life and people constantly tugging for something, keep them lost in the good that is not good enough. Oswald Chambers writes, “The great struggle in the life of faith is not sin but the good that is not good enough.” I don’t want to settle for the good and forsake the best God has for me. I hope you don’t either. On Friday, I received a call from someone who wanted me to clear up some questions and confusion she had about headship and submission. I wasn’t able to take her call, but told her that I would cover it this week. So, here is a sneak preview of some of my new book, which will be out September 2013, on emotionally destructive marriages. As a young wife, I attended a retreat that was geared around becoming a godly woman. Most of the wives in the room groaned when they heard the “S” word featured as our next topic. No wife looks forward to hearing that God says she must give her husband the final say in all decisions regardless of how capable or stable he is, just because he’s the man. I wanted to stand up and scream, “That’s crazy. Don’t’ listen to her!” but I was too much a coward at the time to risk such censure from the group. I’m braver today, and I’m telling you don’t fall for that kind of simplistic and naive teaching on this very important subject. If you want to get clear-headed and be a godly woman, in addition to listening to wise counsel, you must study the scriptures yourself and ask God to help you understand what the Bible says. Jesus tells us that as believers, He gives each one of us the Holy Spirit which He promises, leads us into all truth (John 16:13). The Bible never says that submission is only a wife’s or woman’s responsibility, nor does it say that the husband or man gets the final say in all decisions. These ideas have been misrepresented and misunderstood. Wrongly applied, they can cause harm to men, women, and children, as well as thwart God’s plan for loving family relationships. After Jesus finished washing his disciples feet, he said to each of them, “If I then, your Lord and Teacher, have washed your feet, you also ought to wash one another’s feet. For I have given you an example, that you also should do just as I have done to you” (John 13:14,15). This concept of selfless servant-hood was so radically different from his disciple’s idea of leadership, that they didn’t truly grasp what Jesus meant. Later on, James and John were arguing about who would have the better seat in heaven and Jesus stopped them and taught them the essence of biblical headship. He said, “You know that those who are considered rulers of the Gentiles lord it over them and their great ones exercise authority over them. But it shall not be so among you. But whoever would be great among you must be your servant, and whoever would be first among you must be slave of all.” Jesus expressly warned his leaders not to abuse their power just to get their way or boss people around (Mark 10:41-46; Luke 22:25,26; Matthew 23:3,4 italics added). What Jesus taught was unheard of in Jewish culture. Hierarchy was well established even in the most intimate relationships. Men dominated women; husbands their wives. Paul picked up Jesus’ heart on the subject of headship in marriage when he writes, “Husbands, love your wives, as Christ loved the church and gave himself up for her” (Ephesians 5:25). The essence of Biblical teaching on headship is that if you are the leader, your responsibility is to initiate and model servant-hood before anyone else in the family does. As the leader, you are to show the way. You are to go first. When a leader (whether of a home, a church or a nation) manipulates, threatens and scares people into doing what he says or to get what he wants, know that he is not behaving as a biblical head, but rather as a bully. As Paul writes, “Love does not demand its own way” (1 Corinthians 13:5). Jesus didn’t only model headship for us, he also modeled submission. In the Garden of Gethsemane while anticipating the crucifixion, Jesus’ prayed that this cup of suffering would be removed from him. He dreaded the cross; he wanted God to find an alternate way to save humankind. Yet, Jesus submitted himself when he prayed, “Nevertheless, not my will, but yours, be done” (Luke 22:42). Throughout his life, Jesus always wanted to do what God wanted. He said his will was synonymous with God’s will. (See John 4:34; John 6:37; John 5:3; John 17:17.) Now in his agonizing moment during his garden prayer, Jesus felt differently. This was the first time he didn’t want to do what God wanted, but he chose submission to God’s will and his Father’s perfect plan. God didn’t force Jesus to submit, Jesus chose to. Jesus said, “No one takes my life, I give it (John 10:18). In the same way, biblical submission can never be forced. It can only be done by the one who chooses to submit her (or his) will to another. When we voluntarily give our will to another or to God, it’s called submission. When someone forces our will to be given, it is not biblical submission. The correct terms are intimidation, coercion and bullying. Submission isn’t necessarily agreement; it’s yielding your will to another for a greater good. The good might be unity in the family (or body of Christ) or honoring and pleasing God. The apostle Paul writes in Philippians that we must be intentional if we don’t want selfishness to rule in our relationships (Philippians 2:2-4). He then uses Christ’s example for us to see how that works. Paul writes, “Have this mind among yourselves, which is yours in Christ Jesus, who, though he was in the form of God, did not count equality with God a thing to be grasped, but made himself nothing, taking the form of a servant, being born in the likeness of men. And being found in human form, he humbled himself by becoming obedient to the point of death, even death on a cross” (Philippians 2:5-8). Jesus modeled both headship and submission in volunteering for the servant’s place and yielding his will to God. This describes the working together of headship and submission. The husband sacrificially leads his wife in servant-hood (through example), and the wife sacrificially yields her will in servant-hood (through example). Both are servants of the other and of God. When only one is the servant or the other is the master or god, the marriage isn’t working as God intended. Since the fall of Adam and Eve, human beings have been vying for power and control over one another (Genesis 3:16). This was not God’s original plan, but the result of sin. Biblical headship doesn’t mean you get your way all the time, and submission doesn’t mean you have no voice or choice in the matter. The scriptures validate the mutuality of marriage and the dignity and value of each individual no matter who they are. As Paul plainly wrote, “now there is no difference between Jew and Gentile, slave and free, man or woman” (Galatians 3:28). We may have different roles and responsibilities, but one is not over the other. Mutuality of servant-hood, submission and sacrifice are the biblical model for the trinity and for godly relationships, including marriage. Focus on the Family Broadcast of "Finding Freedom from Destructive Relationships"
How to Live Right When Your Life Goes Wrong book and study guide set by Leslie Vernick. Plus see winners of previous give away! Join Leslie for the Focus on the Family broadcast of "Finding Freedom From Destructive Relationships" on October 17th and 18th. It was a privilege to welcome Leslie Vernick to our radio studio here recently. She did an outstanding job addressing the various issues surrounding abusive relationships, and I''m confident many people will continue to benefit from her wisdom on this important topic. Leslie has a wealth of biblical insight to offer that''s sure to resonate deeply with anyone dealing with difficult people. Despite the abundant availability of both self-help books and bible study materials, many of us find it difficult to apply what we learn, to make that long head-to-heart journey of change. When we are faced with life's daily trials, our responses often lack the Christian maturity we desire--showing us clearly just how far we have to go. It is possible to achieve a deeper, more permanent change of heart? Author and counselor Leslie Vernick says yes. 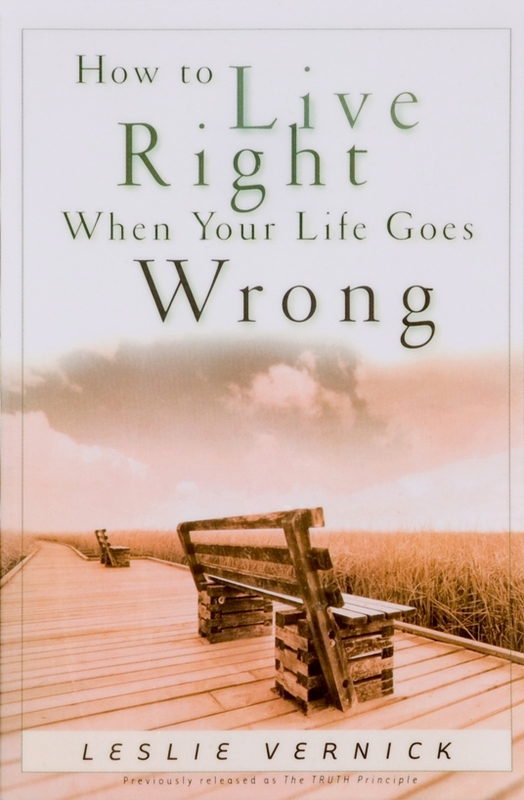 - Gain a new perspective on the troubles that God allows in your life. - Come to better understand your response to those trials. - Discover the underlying idols that hamper your efforts to change. - Learn how to discern the truth of God's Word. - Develop the heart response that will draw you closer to God. Come on a journey of personal growth and spiritual discovery as your heart is drawn back to a central tenet of the Gospel: Truth isn't something you learn, but Someone you know. And the Truth will set you free. Just email your name to assistant@leslievernick.com by midnight Friday, September 28th for a chance to win one of two copies! Congratulations to Shiela R. of Union Bridge, MD, and Rhonda S. of Killeen, TX, winners of LIVE FREE by Kendra Smiley. Oct 17-18 Focus on the Family radio broadcast of "Finding Freedom from Destructive Relationships"
Abraham Lincoln said whatever you are be a good one. Leslie Vernick is not a good coach, counselor, and spiritual advisor.....she is stellar. I came to Leslie needing help with my relationship with my husband. I felt isolated, confused, and somewhat hopeless. Leslie provided me with a compass when I needed direction and gave me a road map to help me find my way. I will be forever grateful for her handling me and my marriage with great care. She left me inspired lifted up and hope filled. No matter where my compass takes me and what direction I take, I now know God has His arms wrapped around me.